DACs are all the rage (again), so we ask if two boxes can be better than one? Musical Fidelity has returned from its latest period of reinvention on something of a roll and the rapid release of new products shows no signs of abating. Following on from the headphone and integrated amps, this is our first experience of the new range of digital products from the company. The M1 DAC has been on sale for a few months now, but has recently been joined by the partnering M1 CDT. This is a brand new product and is, perhaps, the more unusual one of the two. With the general consensus apparently being that all DACs being sold are for a future of computer and streamed audio, the release of a dedicated CD transport into the market might seem an unusual one. 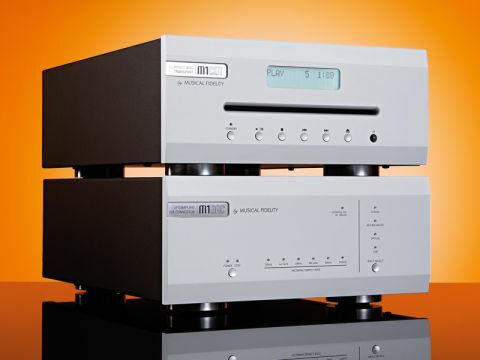 Together, the two products make a £1,000 CD player so naturally we elected to review them as a pair to see if the two-box approach still brings something to CD replay that one box players do not. The £400 M1 DAC is, at first glance, relatively conventional, but proves to contain some neat touches. The half-width chassis contains four inputs selectable from the front panel. The optical, coaxial and USB inputs are expected, but the fourth, an AES balanced input, is more unusual at the price. This, combined with the matching balanced analogue output, allows the M1 DAC to operate in a balanced mode which, if not an absolute guarantee of good performance, is usually a sign that the internals are of reasonable quality. The internals comprise a Burr-Brown DSD1796 DAC chip (supported by a SRC4392 chip) that allows all digital material the M1 DAC receives to be upsampled to 24-bit/192kHz. Another positive feature is that the rear panel features a full-size IEC mains input, rather than relying on a wall wart power supply. While the internal PSU of the M1 isn't especially large (not that it needs to be), the result is neater for installation and the unit proves totally silent in use. The £600 M1 CDT is an identical size to the DAC and together the units are the equivalent of a single full-width component. Its rear panel is conventional enough, but features the matching AES output to feed the DAC as well as more conventional optical and coaxial feeds for other DACs. The mechanism is an inhaler-type drive and is the same specification to the M3 CD, although the mechanisms for the transport are apparently handpicked for the purpose. The result is an elegant-looking unit, although like all drives of this type the M1 CDT will 're-inhale' a CD partially ejected and left poking out of the front if you do not remove it relatively quickly – which can be an annoyance if you have mislaid the box. Like the DAC, the CDT also features a full-size mains input on the rear panel. A remote handset borrowed from the M3i allows for track selection and volume control of Musical Fidelity amps. The fit and finish of both units is good. The front panels are attractive and well laid out, and they both feel impressively solid. They make an interesting comparison to the current crop of CD players fitted with digital inputs. Combining the DAC and CDT via their AES connection gives you a CD player that is fitted with optical, coaxial and USB inputs for additional sources. In addition, the two boxes can live side-by-side on a shelf, be stacked, or indeed be placed a considerable distance from one another. Come the need to upgrade, the two-box layout allows for one box to be upgraded at a time. The only downside to this is that two mains sockets will be required, but otherwise, the combination exhibits considerable flexibility as a pairing and has to be considered good value at £1,000. Listening to the units connected via the AES connection and via the balanced output of the DAC show that the pairing is sonically competitive as well. The overall impression is one of even-handedness and there is a sense that the M1's main ability is to get out of the way of the music and let the disc speak for itself. This seems to be largely down to a flat presentation with no discernable lift at any part in the frequency. This may not sound desperately exciting, but the ability of the duo to bring as little of themselves as possible is great for anyone seeking either a neutral system or wanting to introduce colouration via their amplification or speakers – in other words, at a point where all sources would benefit. The bass and mid bass reproduction is extremely adept. There is considerable low-end weight to proceedings, but the bass avoids any sense of being overblown or overbearing. Orchestral pieces, in particular, benefit from a fabulously natural low-end presence that greatly aids realism. Tonality with vocals and instruments is also very good with excellent decay to plucked strings and piano notes. This is further helped by an excellent and convincing soundstage that usually gives performers space to breathe. The unforced naturalness that results makes this a very easy source to listen to for long periods. When compared to competitors such as Audiolab's extremely advanced 8200CD, the Musical Fidelity combination is less detailed and revealing, but in many ways more natural, as well as being more forgiving of poor recordings. Timing is assured, but the pairing does not inject additional vitality into recordings; this is because Musical Fidelity amps need no help in this regard; but if you are partnering with another amp that is equally neutral, you may find the pairing lacks a sense of excitement. Others will appreciate the extremely even-handed nature of the performance. Listening to other inputs on the DAC, via other CD and DVD players, as well as USB from PC, reveals that the M1 DAC is the main influence of the sonic signature and has to be considered something of a star for the £400 asking price. The same natural, unforced presentation comes through from all inputs and the DAC treads a fine line between being revealing enough to bring details to the forefront, while ensuring that compressed material stays listenable. The unbalanced RCA output of the DAC – once you have adjusted the levels – has the same qualities as the XLR output; although, we preferred the balanced one, if only because both amplifiers we tried it with also work better over XLR. The M1 pairing impressed us greatly. This is a well-thought-out and capable duo that stands comparison to any £1,000 CD player we have tested recently. The performance with CD via the CDT is excellent and the performance of other equipment connected to the M1 DAC is equally strong. The DAC is the more cost-effective component of the two takes some beating for £400. As a £1,000 CD player, the addition of the CDT makes for an engaging combination with considerable flexibility in performance. There is no shortage of competition at or around the £1,000 price point and there will be people who prefer to buy a single box and be done with it, but if you are looking for a player which artfully combines a very natural presentation and brings very little of the character of the electronics to the performance, the M1 system demand an audition.